After nearly a decade of development at UC Santa Cruz and partner institutions, the world's most advanced instrument for directly imaging and analyzing planets around other stars is pointing skyward and collecting light from distant worlds. The instrument, called the Gemini Planet Imager (GPI), was designed, built, and optimized for imaging faint planets next to bright stars, probing their atmospheres, and studying dusty disks around young stars. Installed on the 8-meter Gemini South telescope in Chile, it is the most advanced such instrument to be deployed on one of the world's biggest telescopes. The instrument was assembled and underwent extensive testing in the Laboratory for Adaptive Optics (LAO) at UC Santa Cruz before being shipped to Chile in August. The LAO is managed jointly by the Center for Adaptive Optics and UC Observatories, both based at UCSC. Early studies for the GPI project were spearheaded by the Center for Adaptive Optics, with funding from the National Science Foundation and from the Gordon and Betty Moore Foundation. LAO director Donald Gavel led laboratory research efforts that validated the micromirror and coronagraph technologies. "The early science results look wonderful. It is really pleasing to see all the hard work we've done in adaptive optics over the years come to this kind of amazing result," Gavel said. The instrument uses adaptive optics to clear the image of scattered starlight and sharpen the planet images, a technology that UC Observatories played a pioneering role in developing for astronomy. "Even these early first-light images [from GPI] are almost a factor of 10 better than the previous generation of instruments. In one minute, we are seeing planets that used to take us an hour to detect," said Bruce Macintosh of Lawrence Livermore National Laboratory, who led the team that built the instrument. "Most planets that we know about to date are only known because of indirect methods that tell us a planet is there, a bit about its orbit and mass, but not much else," Macintosh said. "With GPI we directly image planets around stars. It's a bit like being able to dissect the system and really dive into the planet's atmospheric makeup and characteristics." GPI carried out its first observations at the telescope in November with very few problems for such an extraordinarily complex astronomical instrument. "This was one of the smoothest first-light runs Gemini has ever seen," said Stephen Goodsell, who manages the project for the observatory. For GPI's first observations, the team targeted previously known planetary systems, including the well-known Beta Pictoris system, from which GPI obtained the first-ever spectrum of the very young planet Beta Pictoris b. The first-light team also used the instrument's polarization mode, which can detect starlight scattered by tiny particles, to study a faint ring of dust orbiting the very young star HR4796. 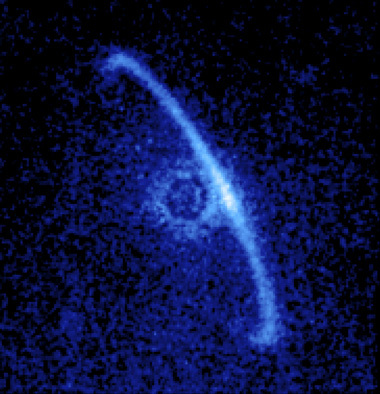 With previous instruments, only the ends of this dust ring (which may be the debris remaining from planet formation) could be seen, but with GPI astronomers can follow the entire circumference of the ring. The group also observed the system of planets orbiting HR8799. Although GPI was designed to look at distant planets, it can also observe objects in our solar system. The test images of Jupiter's moon Europa, for example, can allow scientists to map changes in the moon's surface composition. The images were released today at the 223rd meeting of the American Astronomical Society in Washington DC. 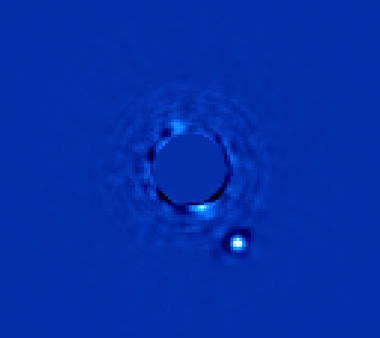 "Seeing a planet close to a star after just one minute was a thrill, and we saw this on only the first week after the instrument was put on the telescope!" said Fredrik Rantakyro, a Gemini staff scientist working on the instrument. "Imagine what it will be able to do once we tweak and completely tune its performance." "Exoplanets are extraordinarily faint and difficult to see next to a bright star," noted GPI chief scientist James R. Graham of UC Berkeley, who has worked with Macintosh on the project since its inception. GPI can see planets a million times fainter than their parent stars. Instruments used to image exoplanets must be designed and built to "excruciating tolerances," said Leslie Saddlemyer of NRC Herzberg (part of the National Research Council of Canada), who served as GPI's systems engineer. "Each individual mirror inside GPI has to be smooth to within a few times the size of an atom," Saddlemyer said. "GPI represents an amazing technical achievement for the international team of scientists who conceived, designed, and constructed the instrument, as well as a hallmark of the capabilities of the Gemini telescopes. It is a highly-anticipated and well-deserved step into the limelight for the Observatory," said Gary Schmidt, program officer at the National Science Foundation (NSF), which funded the project along with the other countries of the Gemini Observatory partnership. Looking through Earth's turbulent atmosphere, even with advanced adaptive optics, GPI will only be able to see Jupiter-sized planets. But similar technology is being proposed for future space telescopes. "Some day, there will be an instrument that will look a lot like GPI on a telescope in space," Macintosh predicted. "And the images and spectra that will come out of that instrument will show a little blue dot that is another Earth." GPI is an international project led by the Lawrence Livermore National Laboratory (LLNL) under Gemini's supervision, with Macintosh as Principal Investigator and LLNL engineer David Palmer as project manager. LLNL also produced the advanced adaptive optics system that measures and corrects for atmospheric turbulence a thousand times a second. Scientists at the American Museum of Natural History, led by Ben Oppenheimer, who also led a project demonstrating some of the same technologies used in GPI on the 5-meter Palomar Telescope, designed special masks that are part of the instrument's coronagraph which blocks the bright starlight that can obscure faint planets. Engineer Kent Wallace and a team from NASA's Jet Propulsion Laboratory constructed an ultra-precise infrared wavefront sensor to measure small distortions in starlight that might mask a planet. A team at UCLA's Infrared Laboratory, under the supervision of James Larkin, together with Rene Doyon at the University of Montreal, assembled the infrared spectrograph that dissects the light from planets. Data analysis software written at University of Montreal, and the Space Telescope Science Institute assembles the raw spectrograph data into three-dimensional cubes. NRC Herzberg in British Columbia built the mechanical structure and software that knits all the pieces together. James R. Graham, as project scientist, led the definition of the instrument's capabilities. The SETI institute in California manages GPI's data and communications.